Don't be fooled by the logo; this is a cartoon I did for a Facebook page called "Barack Obama's Dead Fly" for which I'm a contributor (or perhaps unindicted co-conspirator). 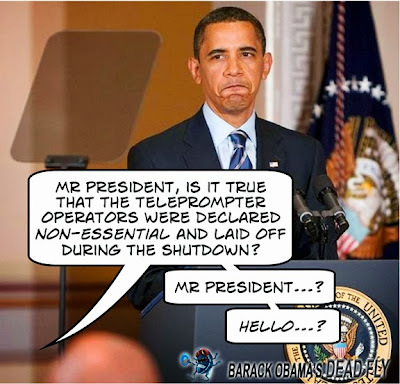 Sadly, this cartoon isn't entirely accurate because Barry is making a point of NOT keeping his mouth shut during the government shutdown. Yesterday, he accused Republicans of "holding a gun" to his head and the heads of the American people. Keep in mind, this is the same guy who claimed that using inflammatory political "words that hurt rather than heal" contributed to whackjob Jared Loughner's shooting rampage in Tucson, Arizona. 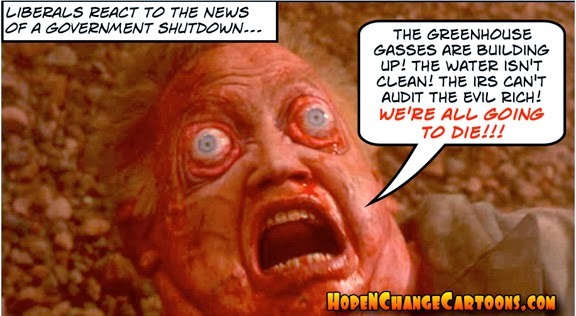 But just in case he can't inspire a new mass shooting, Barry let fly with another pronouncement which may do far more damage: he announced that "Wall Street should be worried this time" about the shutdown and possible default on government debt, in hopes of creating fear in the marketplace and a panicked selloff of stocks which he hopes will be blamed on the GOP. And if millions of people lose money from their IRA accounts, so much the better - because this president wants to cause as much pain to average Americans as possible to strengthen his bargaining position...and barricading national parks and keeping elderly veterans out of war memorials just wasn't making the nation bleed enough. Make no mistake: by making these threats to Wall Street with the goal of creating chaos, Barack Hussein Obama has transcended mere "gun to the head" rhetoric. He is, by action and intent, a financial terrorist. Obamacare is now officially off and running. Or, more accurately, it's not really running, but it's off the tracks like a Hellbound runaway train! Tuesday's "kick off" (which, coincidentally, is what many Americans will do while waiting to get actual healthcare in the future) was hampered by computer "glitches" nationwide...assuming that you define "glitch" as what happened to the Hindenburg when landing in New Jersey. Fortunately, B. Hussein assures us that the glitches should be cleared up in just a few short months, which unfortunately means by the time the sign-up system actually works, the open enrollment period will be over - and many uninsured people will have to wait most of a year for their next shot at the brass ring. But in the larger scheme (and it is a scheme), if lots of people don't get insurance, get sick, and subsequently die, it's still fine. Or more specifically, their uninsured survivors will still be fined. 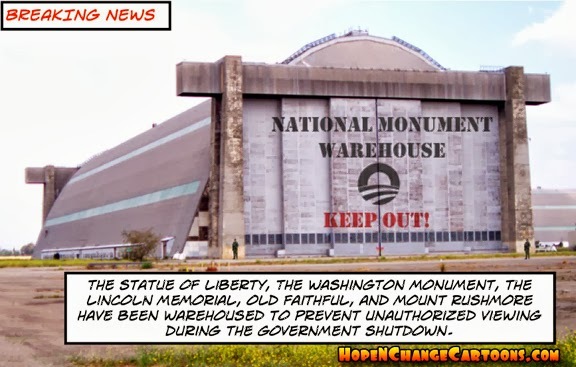 It's official: the government has shut down and Hope n' Change is still here! We win!!! Obama brushed away an imaginary tear as he pointed out that national parks and monuments will be closed for the duration of the shutdown and, if the GOP get their way, Christmas will be threatened (yes, he really said that). As far as we know, the White House Kwanzaa celebration will still be held, and will include the First Family's festive ceremonial lighting of George Zimmerman.